The shift to value-based reimbursement (VBR) entails more financial risk for providers. Successful management of the transition to VBR can only be achieved when healthcare organizations are clinically and financially integrated to ensure tight care coordination and efficient resource utilization. Providers are increasingly in need of trusted vendor partners that offer a full suite of IT solutions and services that can help them navigate the dramatic disruptions that lie ahead. Market opportunities for vendors with end-to-end solutions designed to manage increased financial risk are particularly attractive in this environment. 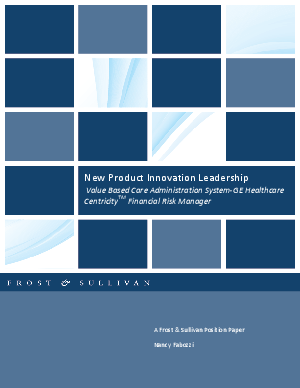 Frost & Sullivan’s 2014 New Product Innovation Leadership award was bestowed on GE Healthcare’s Centricity Financial Risk Manager which is a unique offering in the financial management marketplace that enables healthcare systems to reduce the cost of administering risk-based contracts by streamlining associated business processes, thus improving profitability and maximizing efficient workflows.